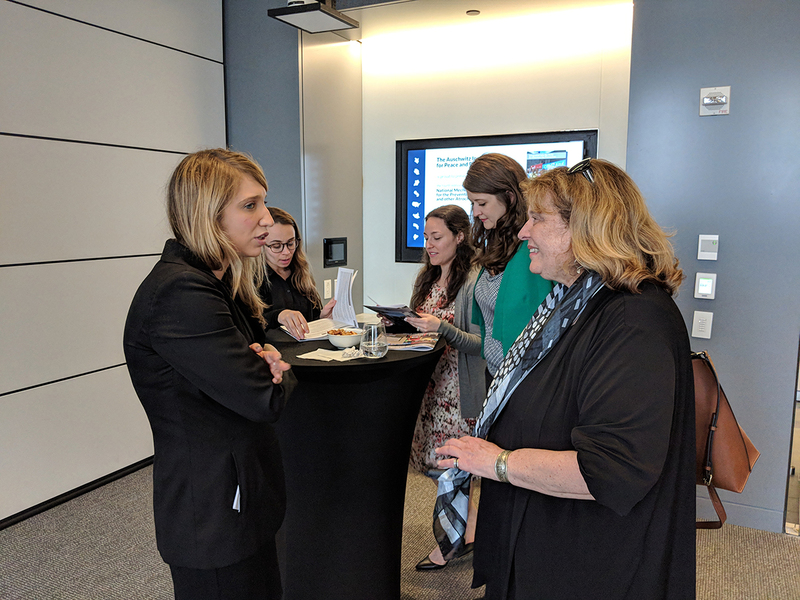 On May 15, 2018, the Auschwitz Institute for Peace and Reconciliation (AIPR) held a launch event at White & Case LLP in New York for the latest addition to its annual Booklet on National Mechanisms for the Prevention of Genocide and other Atrocity Crimes. The fourth entry in the regular publication series, the latest edition is entitled Integration into the State Architecture for Prevention and can be accessed here. The 2018 edition of the Booklet on National Mechanisms brings a new and dynamic approach to the Auschwitz Institute’s coverage of this global trend. The first section of the publication focuses on the character and work of “informal” National Mechanisms. The Global Network of Responsibility to Protect (R2P) Focal Points is presented as an example of one framework through which states around the world have begun to implement activities that lay the foundation for an eventual National Mechanism. The work of Finland’s R2P Focal Point is highlighted as a case study in this process. The second section of the booklet provides updates on the previously featured National Mechanisms of Costa Rica, Ecuador, Kenya, Paraguay, South Sudan, Tanzania, Uganda, and the Unites States. The third section of the 2018 edition was developed in collaboration with the Yeshiva University Benjamin N. Cardozo School of Law’s Benjamin B. Ferencz Human Rights and Atrocity Prevention (HRAP) Clinic. 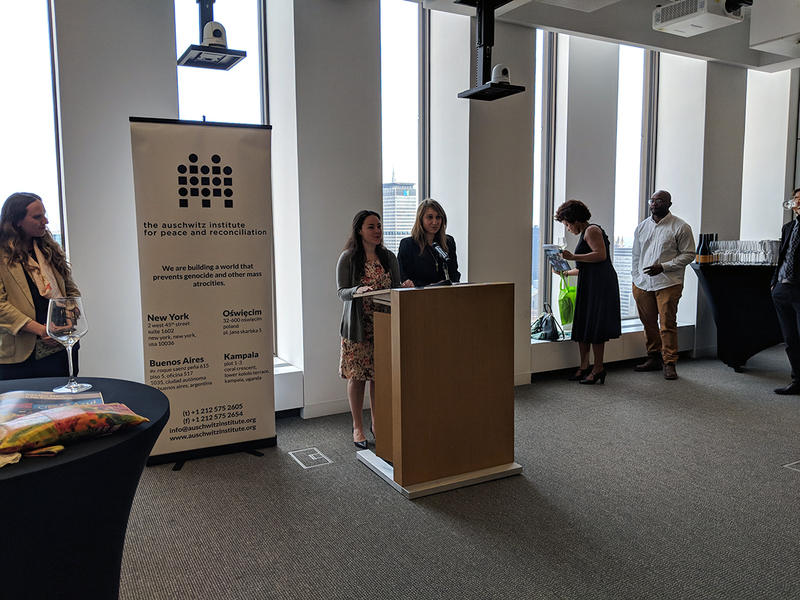 As part of their studies, HRAP Clinic students Ms. Gabrielle Flaum and Ms. Lori Waichman served as co-authors for the publication, undertaking a comparative review of national-level draft legislation efforts which informed the Booklet’s third section on institutionalization. The publication launch event was opened with introductory remarks by Mr. Louis O’Neill, who helps to oversee the pro bono efforts undertaken by White & Case both domestically and internationally. Mr. O’Neill discussed the history of the firm’s support for the Auschwitz Institute and the value of the AIPR’s work in building a future that is free from genocide and other mass atrocities. Ms. Samantha Capicotto, Director of Policy and Planning at the Auschwitz Institute and lead author of the Booklet, took the podium next. 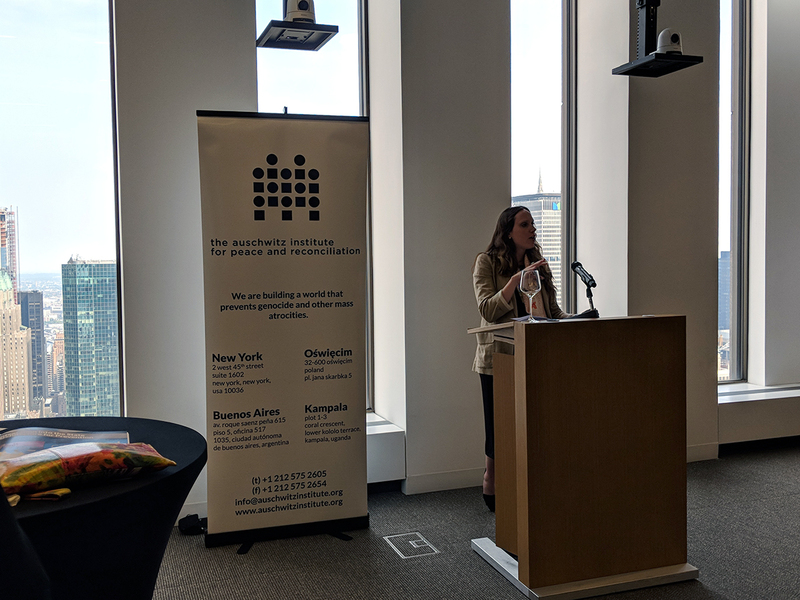 Ms. Capicotto outlined the history of both the publication and several of the Mechanisms that it has covered over the past five years, underlining milestones in the evolution of AIPR’s understanding of the processes by which these bodies form. She then gave a brief overview of the 2018 Booklet before inviting co-authors Ms. Gabrielle Flaum and Ms. Lori Waichman to speak about their experiences in developing the comparative study on legislation for the establishment of National Mechanisms. The 2018 Booklet on National Mechanisms for the Prevention of Genocide and other Atrocity Crimes, along with editions from previous years, can be accessed from AIPR’s publications page or by clicking here for direct access the most recent publication. If you have any questions about the Booklet or would like more information on the Mechanisms contained within, please contact Samantha Capicotto at samantha.capicotto@auschwitzinstitute.org.